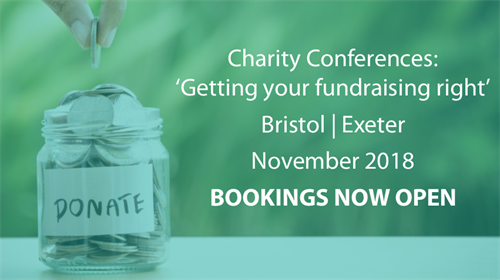 Join us for our Charity Conferences taking place in Bristol and Exeter this November. We will be joined by guest speakers Gerald Oppenheim, Chief Executive of the Fundraising Regulator in Bristol and Stephen Service, Policy Manager of the Fundraising Regulator in Exeter, and speakers from award winning law firm Veale Wasbrough Vizards at both events. The Fundraising Regulator is coming to the end of its consultation on a large scale overhaul of the Code of Fundraising Practice. The Regulator's Chief Executive and Policy Manager will explain the reasons behind the changes, how charity trustees should use the Code to meet their regulatory obligations for strategic oversight of fundraising, and how senior staff should use it to make sure their campaigns are compliant with the law and good practice. The session will also bring you up to date on the Regulator's other work. Veale Wasbrough Vizards will be leading a session on why understanding the duties of charity trustee is paramount, not least in the era of increased regulation particularly in relation to fundraising. This will act as a reminder on trustee duties and, in particular, look at those duties in the context of fundraising with reference to some lessons learnt from regulator reports. The conference will also include a case study from a prominent local charity and updates from the Bishop Fleming team on VAT and taxation issues, as well as developments in financial reporting and corporate governance. This event is free to attend but please note that we anticipate these conferences to be in high demand and would strongly advise booking early. Refreshments will be served at all of the events - please advise us if you have any dietary requirements.